Q: I am not quite sure I am understanding clay. When you use the word clay, do you mean mud, or actual clay. Clay is expensive. So I hope for expense sake, the clay you are referring to for the cob mixture, is mud. And if so, is there a certain kind of mud, or any mud will do? A: Clay is a very common natural mineral found in most soils in most areas of the world. Some soils have a lot of clay; others have a little. Pure clay deposits are rarely found in nature, but they do exist. It is these that are mined, refined, and sold for ceramics and other purposes. For cob and other types of earthen building, you don't need pure clay. You need a clay soil that has a high enough clay content to act as an adhesive for the other ingredients (sand, straw, etc.). Clay soils are characterized by being soft and sticky when wet, hard when dry. Any book on earthen building will explain some simple tests you can use to determine whether a given soil has enough clay in it to be useful. Q: I am an architecture student at Smith College in Northampton MA. My class has been given an assignment to design, and then build a small (8 x 8') cabin/shed/shack place-space of repose.... my group is proposing cob construction. What is the ratio (i.e. earth, sand, clay to straw) that we would need to order...yes, we'd have to order the materials... no on-site materials available. We've purchased the Hand-Sculpted House book, but I haven't found a ratio of materials. A: The reason there is no standard recipe in The Hand-Sculpted House is that there is no standard recipe. This is because clay soils vary so much from site to site. Even if you are buying material, you are unlikely to buy pure clay; that would be very expensive. The book describes a process for determining your ideal mix through a process of testing. Even if you are not going to actually construct the building, this process would still be very instructional for you. Sometimes you can find/buy a soil that already has the ideal ratio of sand to clay. More often you will come up with a clay soil which must be tempered by the addition of more sand. The ratio might range between 2 parts clay soil to 1 part sand and 1 part clay soil to 3 parts sand. When you take 1 bucket of clay soil, mix it with 1 bucket of sand, some water, and some straw, you end up with less than 2 buckets of clay. Sometimes a lot less. That's because through the mixing process you are compressing out most of the air. A lot of the clay takes up what was previously air space in the sand. Make a mix, measuring your ingredients carefully, and then measure how much cob you end up with. As for straw, it will be a minimal percentage, by volume, of the wall. When purchasing straw for a job, I typically buy straw bales to equal about 10% of the volume of cob I will be mixing. This is usually quite a bit more than sufficient, but bales are very useful to have around the site for scaffolding, to make soaking pits, and as ingredients in adobe floors, plasters, etc. Q: How long does it take for cob to dry before you can continue building the rest of the house? A: As you know, the cob is applied to the wall wet. Ideally, it firms up for a few hours or overnight and you add the next layer of cob before the last one is hard; this allows better connection between the courses. So the wall is always dryer on the bottom than it is on the top. When the cob wall is complete it will take some time to dry completely. This could be a matter of days or weeks for a relatively thin wall in dry, warm weather or months or even years for a very massive cob wall in a cool moist climate (historically in England, cob walls were made 3, 4 or even 6 feet thick; I imagine these took a very long time to dry completely there.) By the time the walls are dry to sight and touch they will have completed nearly all of their shrinkage; the plastering can be done at that time and details where the wall meets the roof, etc. But there's no need to wait for the cob to dry to work on many other aspects of construction, such as floors, windows and doors, plumbing and electrical, etc. Q: I am considering building a somewhat large project in Colorado out of cob. Can you give me an estimate of the number of worker hours needed to construct and finish a linear foot of an 8' cob wall (or any other kind of generalized time estimate). I need to know how much work I will be biting off. A few words of advice: take a cob workshop or work with an experienced cobber to learn their systems of production building. Be very organized. And don't take on a large cob project until you have one or two small ones under your belt. Forming systems may also speed up the building rate. For an explanation see the November, 2002 issue of The CobWeb, (from Cob Cottage Company, PO Box 123, Cottage Grove, OR 97424; 521-942-3021). Q: Hi I'm 17 and hoping to build a cob house next year in Washington state. My dad and I will be working on it full time. We hope to start in April. The big thing I'm worried about is the time and not many people to help. We would need a place to live in before the winter. So do you think it would be impossible to build a comfortable sized space between April and October? Comfortable is like 40 feet by 30 for starters. 1) Start smaller. Design your dream home, but make the design modular. Plan on getting one or two rooms complete so you can move in and use them, then expand from there. 2) Try to get a bigger crew. Ask friends and family to commit to helping you out for a month or more. Advertise in cobber's networks ("the CobWeb" newsletter and Cob Cottage Company's Helping Hands Directory) for cobbers looking for more experience. 3) Consider mechanical mixing. One of the biggest labor sinks in a cob building is mixing the cob. Consider using a tractor or back hoe to mix huge batches of cob at one time, so that your available labor can be expended in the actual building process. 4) Do as much preparation this year as you can. Finalize your design, prepare your site, and collect all the materials you will need. Read "The Hand-Sculpted House" thoroughly so you will be as prepared as you can be. Good luck! Q: I am building a small cob house in washington state and the roof and foundation are done we just started cobbing this fall and we have only got about a foot or so of cob on the foundation and it is cracking a lot ..small and larger cracks...I'm thinking it could be too much water or clay..in the mix...we do it all by foot and tarp...and also I'm wondering if this time of year is ok,we have had some heavy frosts and the walls are dying really slow. A: There are two reasons why you might be getting a lot of cracks. The most likely is that you have too high a clay content in your mix. Try reducing the clay content significantly, and/or increasing sand and/or straw. It's always advisable to start by testing a number of different mix proportions before you begin building your walls. Form each mix into large bricks, carefully labeled, and let each dry completely. Then check for cracking, hardness, and tensile strength before deciding your final mix. The other possibility is that the freezing temperatures is contributing to the cracking. This is especially likely if the cracks are mostly on the surface, and if they appear immediately after a heavy freeze. It's best not to expose wet cob to subfreezing temperatures, or your walls could be severely weakened. In general, it's preferable to build in warmer, dryer weather, so that the walls will dry out more quickly (this allows you to build much more quickly) and to avoid frost damage. Q: What kind of mixer can I use to mix cob for building. Would a Mortar Mixer work, or should you have a special mixer. How would a Pan Mixer work? A: A mortar mixer can be used to make cob. It tends to get bogged down trying to make the stiff, straw-rich mixture that is preferred for cob building, so people usually do one of the following: either make the mix wet, then dump it out and let it dry for a while before using it; or else make a stiffer mix without the straw, then add the straw in by foot. I don't know what a Pan Mixer is, but there are certainly other kinds of mixers that can work. The best way to learn how to mix cob is using your feet, and working with an experienced cobber. Then once you know what a good mix feels like, you can experiment with whatever machine you have access to and see whether you can make it work for you. Q: I am thinking of building a small guest house/shelter from cob, our property has sand, silt, gravel, clay, peat moss and sphagnum easily gathered, but straw bales in our area have become quite expensive. I am thinking that because the sphagnum moss is a very stringy and rot resistant plant fiber it might be a suitable substitute for straw. If I were to use it, should I cut the fibers to a shorter length? A: It is possible to substitute other fibers for straw, and it makes great sense to look around for what you have locally. I don't have any experience with sphagnum moss. The question would be whether it is strong enough to provide much tensile reinforcement to the cob. You can test the quality of the fiber just by holding onto both ends and pulling. With good quality straw, it should be very difficult to break just by pulling with your hands. Another good test is to bend it a few times and see how long it takes to break. Different kinds of straw have different amounts of strength, but ideally they should not snap in the first couple of bends. So play around with your moss, do some tests. If you think it might work, make a small batch of cob using it for the fiber, form the cob into bricks and try to break them. Well-reinforced cob bricks should be impossible to break in your bare hands. The other big issue is the amount of fiber you will need. When estimating the amount of straw bales to buy for a cob project, I figure out the volume of the cob (length x width x height) and then divide by ten. That gives me an approximate volume of baled straw that I will need. But keep in mind that baled straw is tightly compressed. If you cut open a bale, the straw will expand to many times the original volume. I imagine your moss is very loose, and therefore takes up a lot of volume per amount of fiber weight and strength. Is it really feasible to gather that much moss? Q: I am about to teach a class on cities of the future, and would like each of my students to be able to build a small cob model. For such a small scale, could I use one part clay (from a store selling pottery supplies) to one part sand, water and some straw to make an appropriate mix? Would you suggest digging for the clay instead...any other suggestions for my young friends? A: You will have to do some experimentation to find appropriate ratios for your cob mix. Different clays have different properties, even bought clay. If you are using a fairly pure purchased clay, you will most likely need to add more parts sand than clay - typically 2 or 3 parts sand to 1 of clay, by volume. You can also of course use found clay, which may be a more interesting experience for your students. You can find complete directions on how to go about prospecting for and harvesting clay soil in "The Hand-Sculpted House" (Evans, Smith, Smiley, 2002) which would also be a great reference for the students. Q: I receive questions daily about mixing cob, mostly concerning which clay they should buy. We are in Portland, Oregon and there is a great resurgence of cob building going on. I understand that traditionally you would use the clay from where you were going to build, but this being a city, its not an option. We sell all different kinds of clay (raw materials, i.e. ball clay, fire clay, bentonite, etc) for ceramic art application and I am curious as to what would work best. I have been recommending fire clay (lincoln 60). A: Almost any sort of clay can be used for making cob. Non-expansive clays are best, including those generally sold as "fire clay" and "mortar clay." Lincoln clays are ideal - very sticky but not highly expansive. Highly expansive clays such as bentonite should be avoided, as they tend to make cob that cracks a lot as it dries. For a large cob project, it's not usually economical to buy clay in 50-lb bags. It's common for a small to medium cob house project to require 20 to 50 yards of clay soil. At that scale, it's generally much more economical to bring in clay soil by the dump truck load. In cities and towns, it is very often possible to get clay soils delivered for free from nearby excavation projects. I recommend that people call excavation contractors in their area and ask if they can get clay delivered for free to their site. The challenge there is the general illiteracy about soil types, which often extends even to excavation specialists. Cobbers I know have had enormous piles of "clay soil" dumped on their sites, which then turned out not to be clay at all. So people need to learn to do some simple testing of "wild" soils to determine their suitability for building, before having it dumped. Chapter 8 of "The Hand-Sculpted House" (Evans, Smith and Smiley, 2002, Chelsea Green) will walk you through a simple testing process that will allow you to quickly evaluate soils for building. C: The thing that people don't like so much and keeps cob from growing faster is the mixing techniques. When I learned how to do it, I was turned off, because my hands and feet were bleeding every time I mixed. It was from the sharp gravel and straw. My back, neck, arms, and body was hurting. I had to figure out a way to solve these issues. Living in LA I do junk yard tours where I find everything to build rocket stoves to mixing tarps that are way more sustainable. Using permaculture design I was able to clean up the cob mixing problems once and for all. Here's a sample of how I see we all could take it to the next level. This tarp keeps the legs active without having to step in the sharp, cold , wet, and slippery mix. It's advantage is that it gives you more foot edge and forces you to keep mixing while dancing. The key is the plastic handles that make it easy to control. This other handle is made of recycled polycarbonate connected to a bill board tarp and makes mixing cleaner, safer, less muscle pain, more productive, lasts 10x longer...able to drag tarp, speed up production. Q: I am from India and I want to construct a cob home. Is it a must to add straw to cob or can I use just mud? If I use straw, how can I avoid the ant menace as I am afraid the house would be attacked by ants? A: The addition of straw is necessary for making good cob. Not only does it provide structural reinforcement for the walls, but it also gives the cob mix the proper consistency for building with. It also helps to distribute moisture within the wall so that the cob dries out more rapidly and there is less chance of catastrophic moisture problems. I'm not sure what to say about the ants. It may be that if the walls are plastered with a straw-free mud mix then the ants will not find the straw in the walls. I would recommend making some cob samples and leaving them in a place where there are ants to see what happens. You could make one sample with no straw, one with straw and no plaster, and another with straw covered with a straw-free plaster, and see what happens with the ants. Q: I live in Bali, Indonesia and I'd like to build a house with a combination of Cob and reclaimed wood. As we have no access to straw here, is it possible to substitute rice husks for the straw in cob? The other option would be rice stalks (which are long and dried out post harvest and traditionally burned here i.e. plentiful and free). A: Here in California my preferred source of fiber for cob is rice straw, which is the bundled stalks of rice. I don't know whether the rice in Bali is the same as here, but I would give that a try. Rice hulls are too short to give you the fiber strength you are looking for, but they can be used in finish plasters and floors. Q: I have been building test bricks with cob and have finally found the right ratio of sand to the clay found in my area to make a solid brick without cracking. However, I am concerned about one thing. I have noticed that when it gets wet, (after it has dried) and if I dabble and rub it with my fingers, the surface will start to dissolve. Is this normal with cob? And if it is normal, will a good roof, foundation, and hydrated lime plaster fix that? A: Any kind of unstabilized earthen mixture (cob, adobe, etc.) will turn to mud if it absorbs enough water. Some mixes are soft and crumbly even when dry, which is generally not good. Others can sit in water for a while without getting soft. It depends primarily on the qualities of the clay in your soil and the amount of silt in your soil. Without testing your soil and touching your block, it's hard for me to say if it's within the normal range or not. If it is really crumbly, you are probably low on clay. Adding straw to your mix will increase the proportion of clay you can use without significant cracking. However, in response to your questions, the basic strategy for preserving unstabilized earthen walls such as cob is to keep them from ever getting very wet. In most places that can be accomplished with some combination of a good foundation and wide roof overhang (at minimum) or porches and water-resistant plasters in addition. Q: We are going to build a light clay straw cabin. We have on our land much hay and would like to utilize that instead of straw. Just wondering what you think of that. The only thing that we can come up with is that it would sprout. A: When grass is harvested to make hay for animal feed, it is cut when the plant is still green and the seed heads are mostly not mature. This maximizes the nitrogen in the plant, which makes it most nutritious for the animals that eat it. Unfortunately, this same nutrition is highly attractive to bacteria, fungus and other micro-organisms which will break down the hay when they get a chance, causing it to rot when it gets wet. In contrast, straw is the stalks of mature grains, left behind as a by-product when the grain is harvested. Straw is made mainly of cellulose and lignin, the same compounds that make up wood, with very little available nitrogen, because the nitrogen has almost all been deposited in the mature seeds. This makes straw much more rot-resistant than hay. I wonder what you mean when you say that you have hay on your land. If you mean that you have a hay field that was cut and baled for animal feed, then I would strongly caution you against using it as a building material. If you mean that you have a lot of wild grass growing on your land, and if you wait until it is fully dry and then harvest it, that could be an OK material to use. You may have some problems if there are a lot of seeds in the grass, either with sprouting (which is not necessarily a big problem) or with animals such as mice trying to eat your walls (also not usually a problem if you do a decent plaster job). On the other hand, if you leave the grass standing in the field long enough, most of the seed heads will probably fall off by themselves. Q: I'm planning on building a cob cottage in Donegal, Ireland by constructing the walls between 2-foot deep shutters, creating a 2-foot high, 20 inch wide lift of cob at a time on the stem wall, letting it dry and then adding on another lift. We would be taking the wall up 8 feet. I reckon it will take each lift about a month to dry out, however I'd like a second opinion on the drying time so I can more accurately plan the stages of the build around the drying time of the cob. If it helps, our soil is 30% clay and 70% aggregate of all sizes from small stones to gravel and sand, and mixes well without the addition of extra sand. A: I'm not familiar with the weather in Donegal, so it's difficult for me to predict how long your cob walls will take to dry. Drying time depends on many factors, including the thickness of the wall, the constitution of the cob mix, temperature, air humidity, and airflow. Here in Northern California, during our hot, dry summer weather, I would expect one of your lifts to dry out within 2 weeks. However, in the winter, when the weather is cool and damp, it could take many months for the same amount of cob to dry completely. Luckily, there's no reason I know of to wait for one course to dry completely before adding the next. In fact, you will get better adhesion between the layers if you leave the top surface of each course very rough and uneven and add the next course as soon as the previous one is dry enough to take the weight. If you can walk on top of the cob without it compressing, it is dry enough to take the next layer. Depending on your weather conditions, that could be as quickly as a couple of days or as long as a week. Q: I began to build a porch and extension on our existing brick-built home. I have completed the foundation and stem wall, as well as the timber frame roof structure on temporary supports. My wife, son and I managed to build up the porch wall with cob up to chest height by the end of November, then suddenly the temperature dropped below freezing and we stopped building. When the temperature rose above freezing over the past few days, I observed surface cracking and crumbling at the top of the wall as it began to thaw, and the wall becoming damp an spongy even at the bottom, which was previously hard and almost dry. I have continued to build with straw bales locked into the cob with hazel pegs and a timber frame. I want to complete the walls in this way, putting in a door to seal the structure, so that the cob has a chance to dry out from the inside over the winter months. I have a curtain of tarpaulin around the whole thing to protect it from wind and rain, as well as a waterproof covering for the roof. What is your opinion on my strategy? Or should I just prepare to strip away perhaps the whole cob wall in the spring, and start again? A: It sounds like the cob was not quite dry when you got your hard freeze. Liquid water expands when it freezes, and if that happens inside the wall it will break the wall apart, making it soft and crumbly. I don't know if the damage is only on the surface or goes deep into the cob; it depends on just how cold it got and how deep the freeze penetrated. You will want to pull away however much cob got damaged and replace it. Unless you can protect the new cob from freezing (say, by wrapping the entire addition in plastic or tarps with a heat source inside), the problem is likely to repeat itself throughout the winter. It would be much safer to wait until danger of hard freezes is past and continue on the project then. Q: I am living in Guatemala and hope to help local peasants construct dignified housing from Cob. I have a question about locally available materials. Here in Guatemala for traditional adobe, people use dried pine needles. Would dried pine needles work as a substitute for straw (which is hard to find in this area of Guatemala). Also, linseed oil for interior finishes is not readily available in Guatemala. What other type of oil would be an adequate substitute? Could we use cooking oil? A: Pine needles generally don't have as much tensile strength as good straw has. You can tell because they are much easier to snap in half. However, I once visited a small village in the State of Oaxaca in Southern Mexico that is made entirely of cob. (This is the only place in Central America I've been with a strong tradition of cob rather than adobe, rammed earth, or wattle-and-daub). There the people use pine needles for fiber rather than straw. The most impressive building in the village is a church about 80' long, 30' wide, and 20' high, with the walls made entirely out of cob. So clearly the pine needle mix is strong enough and durable enough. I would encourage you to use it if that is what is available and what people are familiar with. Yes, I've had the same problem sourcing linseed oil in Central America. Even when I have been able to find it in larger cities, it doesn't seem to have the same drying properties I'm used to in boiled linseed oil available in the U.S. Cooking oil will not work as a substitute. You are looking for a drying oil which polymerizes and turns hard in reaction with air. Other drying oils besides linseed oil include tung oil, poppyseed oil, and walnut oil. I doubt that any of these will be more easily available than linseed. The main consequence of not being able to source linseed oil is that it is much harder to make a good, strong, durable earthen floor. I don't know what the solution is. I have done some experiments with lime/earth floors, but I can't say I've had great success. Historically, blood was used as a sealer for earthen floors. I don't know how much you would need or how viable that would be in your situation. I've also heard of people using motor oil. I don't know exactly what the off-gassing hazards would be, but it doesn't sound appealing. Let me know if you find something that works. Q: We plan to build a cob house in my friend's backyard June 23-25. I am skeptical that this can be achieved in one weekend, but my friend believes that if we have enough friends' help, we could do it. But from what I've read online, it seems as though this could take months or even years. What do you think? A: I will be impressed if you can build a cob house in a weekend! Apart from the number of people-hours necessary to mix and build that much cob, there is the issue of slumping. It is usually not possibly to put up more than 2 vertical feet of cob in a day before the weight overwhelms the stiffness of the material. Then you have to wait for the cob to dry some before adding more. 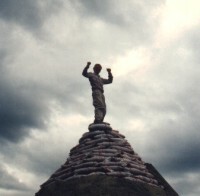 Q: I saw in your blog that you knew some natural builders on the big island HI? I am moving there in a week and am looking into building a cob house in Hilo. After reading your blog, I am curious if the soil is going to be ok or not. A: (Kelly) My understanding is that most of the soil in Hawaii is of fairly recent volcanic origin, which means that clay may be difficult to come by. The required sand may be more easily attainable, or substituted with fine volcanic soil. So a natural binder for cob (clay) may be the problem, in which case you may have to resort to using lime or even cement. Reader Comment: Hamakua coast on Big I has tons of clay, and Kauai has tons of red clay. There is even a company that sells shirts dyed with the red clay. Q: I am interested to find out if the volcanic soil in Hawaii can be used for cob? A: From what I've heard, it can. I don't know much about the structural properties of such cob, however. You will have to make some samples and test them to determine compressive strength. How is the compressive strength of a soil sample tested? Probably any laboratory that tests concrete samples would be willing to test cob samples as well. You could ask your local lab for sample size specifications. Before doing that, however, you will need to make some sample cob batches, form them into bricks, let them dry fully, and then compare hardness, shrinkage, etc. to determine the best mix. There are more details on recommended mix testing procedure in my book, The Hand-Sculpted House. It may be that just by doing your own kitchen-sink tests you can determine whether the mix will be suitable for your purposes. Q: We are going to build a cob or earthbag house in a remote off grid location. We will have to haul in the initial water to use to mix with the soil. About how many gallons of water per cubic meter of mixed cob is required? A: It's difficult to give a precise answer to your question. The amount of water you need to make cob depends on 2 main factors: the exact ratio of your mix and the weather. If you are working in cool, damp weather and your materials are already wet from the rain, it could be that you don't need to add any additional water to make cob. But if the weather is hot and dry, you will need to add water to make the mix workable plus extra to compensate for drying through evaporation before you get the mix onto the wall. I would guess that for every cubic meter of cob you might need anywhere from 0 to 100 gallons of water. 75 gallons might be a safe estimate, but you will need to do some mix testing to be sure. 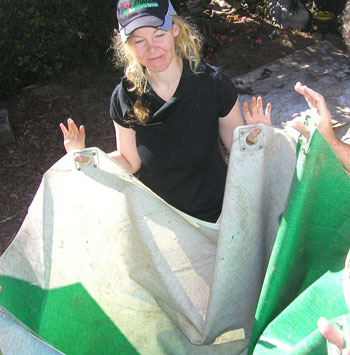 Earthbags of course require water as well if you are filling the bags with soil, but much less than is needed for cob. Q: I recently watched a natural building documentary and it truly inspired me to get started with my cob house. I live in Barbados, a small beautiful island in the Caribbean. My problem is that on the island we have no straw. My alternatives are hay, sawdust or bagasse. Hay is a no no as my reading goes. What do you think? Sawdust is not abundant but a possibility for me. Is this an option for me? Bagasse is the fibre from sugar cane. It is very strong but my concern is that the fibres are only 1 to 2 inches in length. Is the length a problem? A: I have used hay for cob when straw was not available. It is more prone to rot and mold than straw, which could be a problem in your climate. The bagasse fibers are much shorter than ideal for cob, but they could work. The sugar residue could also attract fungus or insects. Sawdust will not work to provide tensile reinforcement, which is one of the main functions of the fiber in cob. I would make some test mixes using hay and bagasse (and a combination of both), form them into large blocks representative of the wall thickness you intend to build, let them dry, and then test them for strength. I would expect most problems with rot and mold to show up during the initial drying process rather than later on, so you should be able to get a good idea fairly quickly of what will work best. Let me know the results! Q: I am developing a resort based on rammed earth and cob, in India. For stabilizing I am using hydrated lime and wheat husk. The soil available on site is red soil. The walls are tapered from outside with width of the wall ranging from 60 cm to 30 cm at 240 cm height. The walls are 2 months old but cracks are appearing all over the walls. Also, due to lack of experience of labour the width of walls is lesser at certain points, so is there any way to putting more mud mixture (with lime and wheat husk) to the already dry mud walls? A: Cracking in the walls as they dry indicates that you have too high a concentration of expansive clay in your mix. The standard way to remedy this is to increase the proportion of sand in the mix. You will need to do some trials with different mixes to find one that is strong but doesn't shrink and crack too much. Another possible solution is to increase the amount of long, strong straw in the mix. This will also reduce or eliminate structural cracking as the cob dries. Wheat husk, if you mean the seed hull left over from threshing, will not make a good reinforcing fiber because it is not long enough. Most cob in the USA has a lot of both sand and long straw added to the clay soil. The lime you have added may be making the problem worse since lime also shrinks as it dries. Typically you need 3 parts sand to every 1 part lime to avoid cracking. If you aren't able to acquire sand or straw economically or in large enough quantities to make a crack-free wall, I would suggest you experiment with adobe. With adobe (sun-dried mud bricks), even if the mix shrinks a lot as it dries, the shrinkage is occurring only over the size of a brick rather than a whole wall and sometimes the bricks will not crack. You can almost certainly patch your existing walls by adding more cob as a thick plaster to even out the walls and cover over the cracks. However, this will not address the structural issues if you have major cracks in the wall, so it is not an ideal solution. Q: I am from India. What type of cob house, for permanently living there with my family of four do I construct? When to start project? Winter +2-3 degrees or summer + 46 Degrees. A: The best time to build the cob walls will be during your driest season, as long as the temperatures are not too cold. Drying time is reduced by low air humidity, air movement, and high temperatures, so whenever you have the best combination of these factors is when you will want to focus on the cob. Unless you have a long dependable dry season, you will probably want to erect the roof first before you start building cob. Q: I am enquiring about making cob - with coconut fibres from leaves and also with coral sand - will either work? A: I'm sure that coral sand would work for cob if you can find the right size and grade. It's best to have sand particles ranging in dimension from 1/4" or 1/8" (about .5 cm) down to quite small, with a good mix of different sizes. I don't know about the coconut leaf fibers. I've never tried or heard of anyone using them, but that doesn't mean they won't work. Fibers for cob should ideally be both strong and flexible, and roughly 12" (30 cm) long. But people have used all sorts of fibers that don't necessarily meet all those specifications. Q: I know soil is made up of a ratio of silt/sand/clay, but the info I’ve seen leaves out silt, only discusses clay to sand ratio. Can you elaborate on the effect of silt content as my soil is mostly clay/silt with some sand (maybe 40/40/20 or 45/45/10) And is there any way to amend this soil to make it better? A: Silt provides little or no benefit in a clay soil, but it is a common ingredient; most clay soils contain some silt. Cob or adobe mixes made with high ratios of silt are weaker than those without, but the amount you mention is nothing to be worried about. As long as you have enough clay in the soil (which you certainly do if you have anything like the proportions you cited), all you need to do is add sufficient sand to result in a strong, crack-free mixture. Make some sample bricks using different ratios of added sand (and straw) to determine the best recipe for your soil. Q: I am a practicing Architect from Maharashtra, India. I am constructing a cob house in area called Mandu, in central India. we have three types of soil. Red, Black and Grey. We tried to test different compositions with soil available (almost 10 samples). We made samples of them, and observed them for almost 10 to 15 days. Few of them showed good results. we thought of using two compositions I am mentioning bellow for COB walls. 1. 2 portion of Black soil, 1 portion of manufactured sand (3 to 5 mm in size), 1/4th portion of hydrated lime, wheat grass, and approximately 50 gram of guar gum for 50 KG of material. (we wanted to try black soil though we always read that it is not good for construction, and also the sample showed a good result) 2. 2 portion of Red soil, 1/4th portion of hydrated lime, wheat grass, and approximately 50 gram of guar gum for 50 KG of material. when we started constructing walls, we are observing few typical problems repeatedly, which we never found in samples. Our wall thickness is 450 mm, that is 18". vertical cracks roughly after every 18" to 24" distance occur on second day after we lay it... some times horizontal cracks between the yesterday's and today's layers... a continuous vertical cracks in corners... I request you to please guide us on this..
A: The cracking you describe is the result of an overly expansive mix. This can generally be remedied by adding more sand to your mix, although in some cases with highly expansive clay soils, it is difficult in practice to add enough sand to prevent cracking. Small sample will shrink without cracking, so the cracks will only show up on a larger scale. (Although you can measure shrinkage in your small samples during the drying process, and that will give you a pretty good idea of the amount of cracking to expect. It may be that you can fix your problem simply by adding more sand. I’m also concerned about your fiber material. When you say “wheat grass”, do you mean green wheat grass, or dry wheat straw? Green grass does not have much fiber strength and will create a weak wall. Please substitute straw if you are not already. Combining lime with clay produces unpredictable results. Sometimes you get a more stable and resistant mixture, sometimes the opposite is true. I believe this depends on the chemistry of the soil. Did you prepare samples with no added lime, and did you get acceptable results? I never add lime to my cob due to the unpredictability, increased cost, environmental impacts, as well as the difficulty of working the material without skin protection. If you are determined to add lime, I would try reducing the proportion of lime in the mix and/or increasing the sand, as lime is also expansive. What you are saying is true. in small samples it is pretty good, but showing cracks on larger walls. We fixed it by adding more sand in it. We have also made some samples in last week, with less lime and without lime, and they are under observation. Till now they are showing equally good results. Yes the wheat grass is wheat straw, chopped to the size of around 2 inches. Guar gum is made from legumes called guar beans which is a vegetable, and used in medical and food industry. It is an additive ingredient type. It is valued as a emulsifier, thickener and stabilizer. Try using longer straw. Usually for cob purposes straw lengths more in the range of 8-12” (20-30 cm) are preferred. This will make the wall stronger and also reduce the size of cracks.